Search for all "IL17RB / IL17BR"
Rabbit anti Human IL17RB / IL17BR. IL17RB is a cytokine receptor. This receptor specifically binds to IL17B and IL17E, but does not bind to IL17 and IL17C. This receptor has been shown to mediate the activation of NF-kappaB and the production of IL8 induced by IL17E. 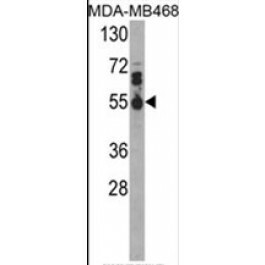 This antibody reacts to IL17RB.